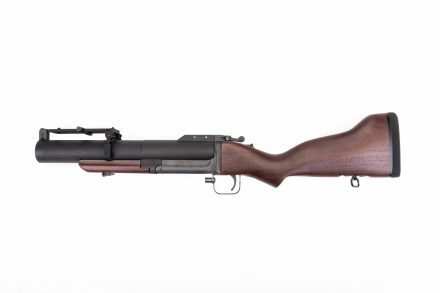 Have you ever wanted the pleasure of owning an M79 40mm Grenade Launcher, but didn’t want to deal with all the hassle of actually trying to own an authentic model? Then you might want to take a look at Spike’s Tactical’s ST Thumper. Named after a popular slang name for the M79, the ST Thumper is a full-weighted replica, 9lbs of wood and steel, and chambered for 37mm flares, to avoid classification as a Destructive Device. Spike’s Tactical has a number of different “designer” lowers for real steel shooters. Today we’ll look at the Pirate version. Could be perfect if you are a pirate (though truthfully that would mean you’ve lost most of your teeth, chew qat and prefer an AK) or better yet if you’re a pirate hunter. Killing pirates isn’t such a bad idea. Too bad the government no longer issues letters of marque. 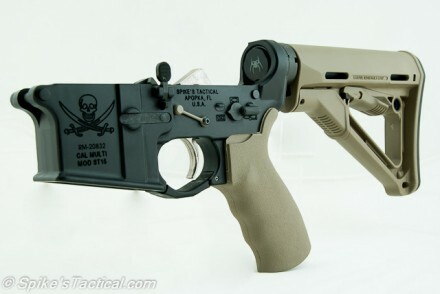 The one pictured is the ‘Pirate Lower w/ Enhanced Kit: FDE CTR Stock & MOE Grip”. It runs $444.95. It features the Calico Jack logo instead of their typical Spider logo, and the selector switch markings are bullet pictograms. Though they don’t show it specifically, you may be able to get a color fill job on it if you want (see below). Spike’s Tactical AR pieces come with a lifetime warranty. Full specs below. Also check out their video on how to zero your weapon, it’s really good.